A church in the Clay - Pinson - Trussville area dedicated to telling the world about Jesus Christ through worship, ministry, and fellowship. • Sundays at 8 a.m.
• Sundays at 10:30 a.m.
• Sundays at 5:00 p.m.
• Sundays at 9:30 a.m.
• Wednesdays at 7 p.m. Selecting a church home can be a difficult decision. There are well over 1,000 places where people gather together to worship in this area alone. With so many different beliefs, doctrines, and practices to consider, it truly can be an overwhelming experience. 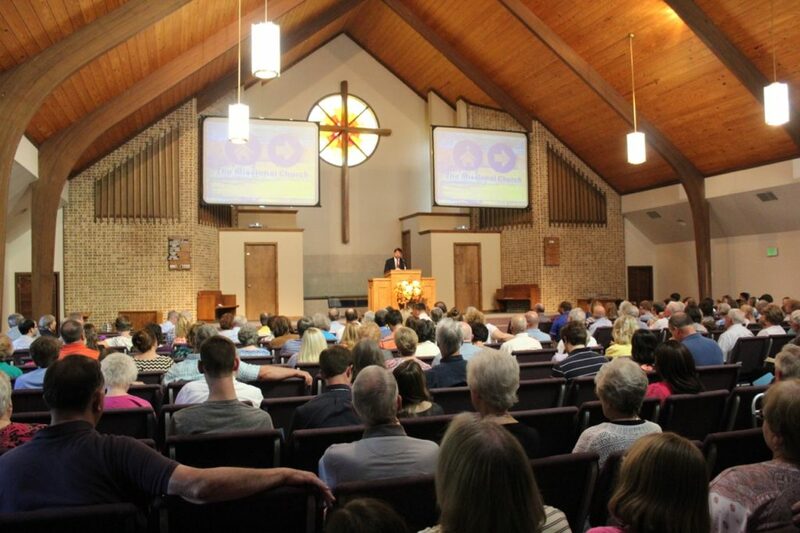 Below is a window into our congregation. Much like window shopping, the information below is a starting point to help you see who we are, what we believe, and why we want you to join our church family. As you look closely, you will find we are simply a collection of people like you, who come together to serve the one true God who loves us, and His only Son Jesus Christ. After reading the information below, you may still have questions. If you do, please get in touch with us through one of the many ways that you’ll find on this site. We would love to answer any questions you have and be of any assistance to you that we can. We hope you will like what you see and come and be a part of something special–the family of God at Deerfoot Church of Christ. When in the community, we find that many people are curious about our worship. The simplest way that we can explain our worship is to point you to the Bible. We strive to worship the way the church did in the first century, according to the Scriptures. Here is a synopsis of what you can expect when you visit with us. When you get to our building, you’ll be welcomed at the door by greeters. These people are there to make sure that you are welcomed and to help you find your way around the building. Services will typically start with singing and a prayer. We’ve found that our singing is the area of our worship that we receive many questions about. Sometimes we are asked: Are you the church with no music? The truth is that we are passionate about our music. We are so passionate about our music that every member is asked to take a part in it. No, we don’t use instruments, such as pianos and guitars. This is simply because we are commanded in the New Testament to “address one another” by “singing and making melody in the heart” (Ephesians 5:19). We’re just 21st century people trying to be the same church Jesus started in the first century, doing Bible things in Bible ways. As a visitor, you have no obligation to sing but feel free to join us in our singing if you wish. We will come to a point in our service when we begin to focus on the Lord’s Supper. We do this every Sunday as the Scriptures indicate the first century church did (Acts 20:7, 1 Corinthians 11). There will be a man of the congregation who will either read a scripture or give some thoughts about what we are doing and why we are doing it. We partake of unleavened bread, which reminds us of the body that Jesus sacrificed and then we partake of the fruit of the vine which reminds us of the blood that He shed. This is a focal point of our worship and helps us to always remember the sacrifice that was made on the cross for our sins. Following the Lord’s Supper, we give of our many blessings. As a visitor, you will have no obligation to give. Funds are gathered to help the work of the local church, to assist the poor, and to support the spread of the gospel. This is done by the example of and the command to the first century church in 1 Corinthians 16. After additional songs and a Bible reading, our minister will deliver the sermon address. This lesson will last about 25 minutes and will conclude with an invitation and a song that will give people the opportunity to come and express any needs they have, such as requests for prayers, re-dedication, or baptism. This is typically followed by congregational announcements, a closing song and a closing prayer. We know this sounds like a long process, but it’s really not. We just want you to know exactly what to expect. Our worship services usually last between an hour and an hour and fifteen minutes. >While worship is an important part of what we do, we are only in worship or Bible class together about 3-4 hours a week. So what do we do with the other 164 hours in a week and how do we live? Salvation is accessed from faith, repentance, confession and baptism. While God’s grace is powerful, the Bible is clear that a person must take certain steps to access that grace. When teaching the first gospel sermon (Acts 2), Peter was questioned by the very people who crucified Jesus. The Bible says that they were cut to the heart and asked “Brothers what shall we do?” Peter responded, “Repent and be baptized every one of you in the name of Jesus Christ for the forgiveness of your sins, and you will receive the gift of the Holy Spirit.” The New Testament is filled with examples of conversion. We would love to share more of these with you either through a Bible study in your home or through a mail-in Bible course. The quickest way to set this up is to contact us. Where the Bible speaks, we are to speak boldly. Where it is silent, we are to be silent as well. 2 Timothy 3:16-17 says that all scripture is God breathed and that it is what will make the man of God perfect and thoroughly furnished for good works. There is no doubt that man has found innovative ways to change worship and Christian living, but it is not by these men that we will be judged. The plea of this church is simple, New Testament Christianity – nothing more and nothing less. The Bible calls us to a higher way of living. Many people will tell you that there are no absolute truths in the world. They will ask “How can we really know what is right and what is wrong?” We believe that those answers are clear. We know right and wrong by the inspired word of God. We echo the sentiment of the psalmist in Psalms 119. (159) Consider how I love your precepts! Give me life according to your steadfast love. (160) The sum of your word is truth, and every one of your righteous rules endures forever. (161) Princes persecute me without cause, but my heart stands in awe of your words. (162) I rejoice at your word like one who finds great spoil. (163) I hate and abhor falsehood, but I love your law. The Deerfoot Church of Christ is conveniently located on Old Springville Road in the city of Clay. The building, formerly owned by the Springville Road Church of Christ, is located a short distance from Chalkville Mountain Road and the city of Trussville. When you arrive at our building, you will find parking which is well lit and monitored for your peace of mind while you join us for worship. 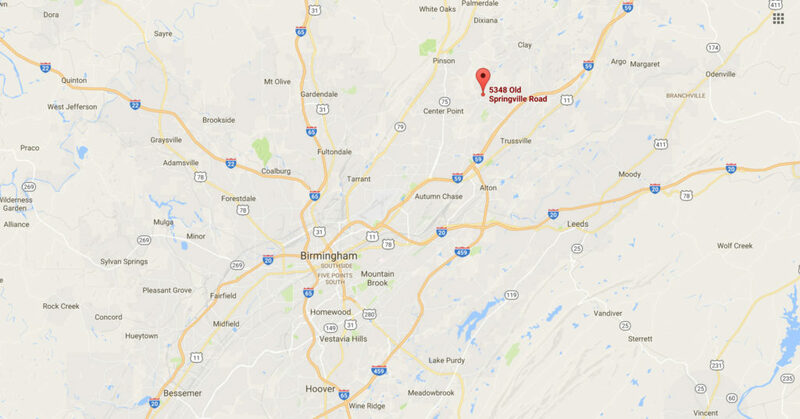 If you are driving north on I-59 from Birmingham, take exit 141, turn left onto Chalkville Mountain Road, drive 2 miles, turn right onto Old Springville Road, then turn left into the church parking lot. For more detailed driving directions from your current location, click here.